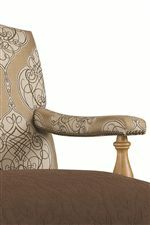 Dress up your room with the elaborate details of the gorgeous Harmon Side Chair. From head to toe, this chair exemplifies class and sophistication with its traditional style pad feet and frame detailing. 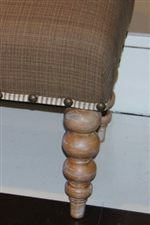 Intricate carvings along the apron, knees, and back frame give this chair character and personality that will allow it to stand out in whichever room placed. Romantic with an antique quality, this chair will simply be great paired with the matching Writing Desk or as a dining side chair. The Modern Bungalow Harmon Side Chair by Linwood Furniture at AHFA in the area. Product availability may vary. Contact us for the most current availability on this product. Finish Wood accents are offered in four wood finishes: Whitewash, Black Over Brown, Worn Oak, and Antique White. Finish & Paint Options Each wood piece in the following flecked and chipped finishes: Vintage Cream, Weathered Sage, Lambswool, Hearth Black and Somerset Blue. 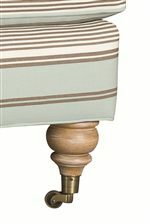 Fabric Options Choose from 24 vintage-inspired ticking, checks, prints and textured solids presented in four color palettes which include: warm ocean blues and greens; khaki, brown and earth tones; crisp black and white; and vibrant reds. Frame Construction Solid-Wood Frame Construction. Padding & Ergonomics Down-Wrapped Cushions. A true representation of an artisan’s aesthetic, the Modern Bungalow collection will bring both purpose and beauty into your lovely home. The collection channels the authentic design and honest craftsmanship present in the Arts and Crafts Movement and quintessential bungalow style. Each of the 21 items in the collection are handcrafted from solid wood in North Carolina and brought to life by its ornate workmanship, texture, fresh color palettes, and inspiring fabric choices. Complimenting the casegoods are five multi-layered finishes featuring flecking and chipping for a vintage appeal. They include: Vintage Cream, Weathered Sage, Lambswool, Hearth Black and Somerset Blue. The casegood items display beautiful scallop details, turned legs, and laser-cut fretwork creating beautiful silhouettes and a touch of French style. For the upholstered items, each frame style draws inspiration and its name from one of the popular kit homes of the 1920’s and 1930’s; simply a modern reinterpretation of the crisp and classic silhouettes of the past. 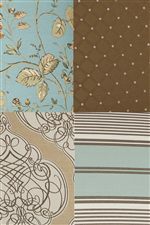 Choose from 24 vintage-inspired patterns that consist of a variety of prints, textured solids, checks and tickings. The color palettes include: warm ocean blues and greens; khaki, brown and earth tones; crisp black and white; and vibrant red. Wood accents on the upholstered pieces are offered in four wood finishes: Whitewash, Black over Brown, Work Oak, and Antique White. With so much style and versatility, Modern Bungalow invites you to curl up, get comfortable and relax with the pleasant nature of the collection. The Modern Bungalow collection is a great option if you are looking for Cottage furniture in the area. Browse other items in the Modern Bungalow collection from AHFA in the area.